Schaumburg resident’s experience in alternative fund is painful to accept, spurs complaint with agency that has issued a warning about such investments. 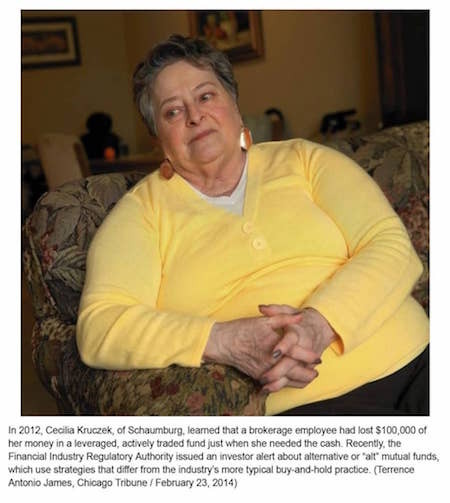 Cecilia Kruczek, a retiree living in Schaumburg, thought she could relax after she rolled over the individual retirement accounts held by her late husband. The nest egg had been held in bank certificates of deposit, but Kruczek’s sister and niece recommended that she get professional financial advice from a brokerage. Her main goal was to safeguard her principal, but she said the brokerage, in 2010, began putting most of the money, $223,000, into a leveraged, actively traded fund that invested in precious metals. In 2012, Kruczek learned that a brokerage employee had lost $100,000 of her money just when she needed the cash to buy into an assisted living facility after a lengthy hospital stay. “I was hysterical when I realized what was going on,” said Kruczek, 73. Last year, she filed a complaint with the securities firm watchdog Financial Industry Regulatory Authority; the case is ongoing. Recently, the Financial Industry Regulatory Authority issued an investor alert about alternative or “alt” mutual funds, which use strategies that differ from the industry’s more typical buy-and-hold practice. FINRA recently issued an investor alert about alternative or “alt” mutual funds, which use strategies that differ from the industry’s more typical buy-and-hold practice. An alternative fund often holds more nontraditional investments and employs more complex and aggressive trading strategies, including the use of leverage and the purchase of swap agreements and other derivatives, to boost performance on a daily basis. Last month, two St. Louis brokerages owned by Stifel Financial Corp. were ordered to pay more than $1 million in restitution and fines for selling leveraged exchange-traded funds to 65 consumers who suffered losses. FINRA said some brokerage representatives didn’t even understand what they were selling. Stifel neither admitted nor denied the charges, but it consented to the entry of the findings, FINRA said. As of the end of 2013, more than $3.3 billion was invested in U.S. leveraged mutual funds like the one that Kruczek invested in, up from about $2.1 billion in each of the previous two years and at a six-year high, according to funds tracker Morningstar Inc. When the market is volatile, investors who own these securities “have a real chance of losing significant sums of money quickly,” Stoltmann said. Kruczek’s claim is against LPL Financial, H. Beck Inc. and her broker. Her broker briefly worked for LPL before joining H. Beck. LPL declined to comment, saying the case was pending. H. Beck also declined to comment. The broker has been in the industry since 1987 and has three other complaints on his record, mostly related to not disclosing risks or misrepresenting them. Among other things, Kruczek’s claim alleges, the broker failed to adequately disclose the risks of the leveraged precious metals fund. “This is a little old lady who couldn’t afford to take the risks associated with the products,” Stoltmann said. Kruczek was born in Chicago, graduated from Good Counsel High School and didn’t go to college. In January 2010, she began to invest her husband’s retirement money, which was most of her investable assets, with the broker. It totaled $222,600. She said that he assured her that she had nothing to worry about. He told Kruczek that precious metals were the only way to make a return. The fund’s prospectus said it’s riskier than a fund that doesn’t use leverage. Some of the money was put into a variable annuity that also invested in the precious metals fund. Variable annuities are frequently criticized for their high costs and commissions. Although her account was marked “growth,” given her age — she was 69 at the time — and status — widowed and retired, with little prospects for returning to work — principal conservation should have been a priority, her claim says. In August 2011, she fell and had to have emergency back surgery. She remained in a hospital until almost Thanksgiving because of infections. She was transferred elsewhere for rehabilitation and assisted living until March 2012. She didn’t become aware of the activity in her account until July 2012, when she wanted to use her money to purchase a unit in an assisted living facility. Other allegations in her complaint include breach of fiduciary duty, negligence and failure of supervision. Had the broker invested the money in a fund merely tracking the Standard & Poor’s 500 index, she would have seen growth. By November 2012, Kruczek had had enough, fired the broker and pulled her money out of the precious metals fund. In retrospect, Kruczek said she wishes that she had asked others besides her sister and niece for recommendations. “I felt that my family members know him, so I could trust him,” she said. She said she has two friends who are millionaires and who have brokers at another firm. “They must have set rules” about investing older people’s money, Kruczek said. She said the experience caused a rift between her and her sister but that she is ready to patch things up. “Life is too short to be angry,” she said.